Welcome and Opening Remarks Facilitated by Pete Gates and Drew Egan The excitement continues Center Stage! with CU Solutions Group Chairman Pete Gates and CU Solutions Group President/COO Drew Egan welcoming attendees. MCUL and Affiliates would like to congratulate the winners of the Chapter Effectiveness Award and the Community Volunteer of the Year. MCUL and Affiliates would like to congratulate the winners of the Adult and Youth Financial Education Award. 2015 AC&E: CU of the Year (Large) - Mich. Schools & Govt. MCUL & Affiliates sends its congratulations to the 2015 Outstanding Credit Union of the Year in the large asset size category, Michigan Schools & Government Credit Union. MCUL & Affiliates sends its congratulations to the 2015 Outstanding Credit Union of the Year in the small asset size category, Limestone FCU of Manistique, MI. 2015 AC&E: The Water Coolers' "Credit Union Song"
2015 AC&E: The Water Coolers' "Communication"
2015 AC&E: The Water Coolers' "Acronyms"
2015 AC&E: The Water Coolers' "Champions of Michigan"
Ken Segall, the advertising executive behind Apple's 'Think Different' Campaign, treated AC&E attendees to a humorous keynote about the need to keep things simple -- Ken later spoke with CUBE TV to elaborate on his message. Jack McCall, an accomplished motivational humorist, brought his unique brand of storytelling and insight to the 2014 AC&E to encourage attendees to draw on the "human equity" in their own lives. U.S. Rep. Gary Peters, candidate for the U.S. Senate, stops by to meet credit union leaders at the recent Annual Convention and Exposition. Peters offered his continued and unwavering support for credit unions. Credit union professionals came together in support of Children's Miracle Network Hospitals at the 20th Annual Michigan Credit Union League Charity Golf Outing -- in total, $32,000 was raised. 2014 AC&E "Know Before You Go!" Dynamic speaker Steve Gilliland kept the crowd laughing with his engaging message of how to “Enjoy the Ride” that life offers. U.S. Congressman Gary Peters (D-Bloomfield Hills) graciously accepts MCUL’s endorsement of his Senate campaign and reiterates his support for the credit union industry, its legislation, and its tax exempt status. Catherine Roberts spent more than three decades as a credit union CEO and blazed trails for women in the industry along the way. This video celebrates her many achievements and contributions to the industry. United FCU made headlines in the industry by becoming the first ever federally chartered credit union to purchase a bank. Here how that accomplishment and many others led to United’s selection for this award. MCUL & Affiliates salutes the many Michigan credit unions who won recognition at the state and national level in the 2012 Dora Maxwell, Louise Herring, and Alphonse Desjardins Awards. This short, animated video provides a snapshot of all that the state’s credit unions and MCUL accomplished in 2012. The 2013 AC&E is fast-approaching and there are many exciting events to come. Be prepared and "Know Before You Go!" with this these helpful hints! For a full list of scheduled events and more information Click Here. 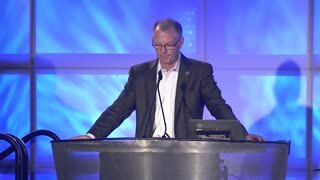 In his general session remarks at the 2012 AC&E, MCUL CEO Dave Adams discussed the many recent successes of the Michigan credit union community, and what can be done to leverage those achievements to take the movements to new heights. Financial industry expert Bert Ely led a discussion of the directions of the mortgage and loan markets -- giving insights into the outlook for financial institutions over the next several years. NCUA Chairman Debbie Matz shared her thoughts on the difficult year and the ongoing work of the national regulator to support and protect the credit union industry. Freakonomics co-author Stephen Dubner spoke to the 2011 MCUL AC&E crowd highlighting the importance of recognizing the importance of behavioral incentives and triggers in the business world. MCUL Board Chairman Andy List opened the general session at the 2010 AC&E with positive words about the valuable services that credit unions provide for their members and communities. 2010 Gubernatorial candidate and Rep. Pete Hoekstra (R-MI) spoke at the general session of the 2009 AC&E. Hoekstra talked openly about his vision for the state, if he were to be elected. Dr. Charles Ballard, MSU Economics Professor, talks to the 2009 AC&E general session about the state of Michigan's Economy. Director of Public Affairs Mike Bridges has a short preview of the MCUL GAC. MCUL will provide video updates beginning April 16. Allan Kemp McMorris invites you to attend the CUNA GAC, which includes a new kick-off event with the band America, keynote speakers Gen. Colin Powell and Chris Matthews.